'Gaeran Mari', which literally means egg roll in Korean is another easy side dish you can make with ingredients you already have in your fridge. It's so comforting and nostalgic, I love having this with any kind of kimchi dish. The rolling part might be tricky at first but you will get used to it with practice. 1. Beat the eggs in a bowl then mix in the remaining ingredients. 2. Heat some oil in a pan on medium heat. 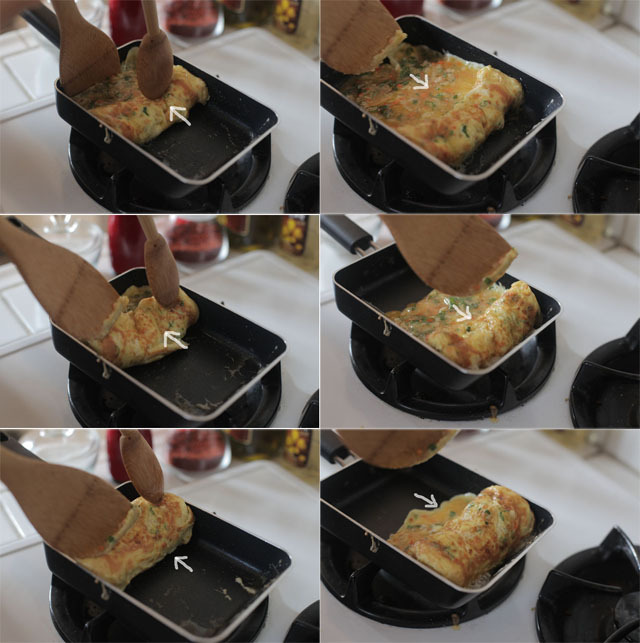 Here we are using a square omelet pan. If you don't have a square one, just use a small round pan. 3. When the oil is hot pour in the egg mixture. 4. When the egg is halfway done start the roll by folding over a small section on one side. 5. Using a spatula pull the folded part back to the edge. 6. Repeat this until all the egg is rolled up. You may need to use 2 spatulas. 7. Pat the finished roll with the spatula to get it into a nice shape and let it cool down for a minute. 8. Use a sharp knife to slice. 9. Put on a plate and serve. We especially like it with kimchi jjigae. wow, that looks so good! :) thanks for sharing. i have never mastered the gaeranmari fold! i'll try it again - determined to get it right after seeing this post! I had almost forgotten about gaeranmari until you posted this! Fond memories. My mom used to just make a big batch in a normal sized, round pan. Going to make this tonight, thanks for the post! This looks so good, I have to try this for sunday's breakfast! i think i really need a square omelet pan, now. thanks for this yummy looking recipe. can't wait to try it! I'm Brazilian..when I was living in Sao Paulo, I used to eat Korean food!!! :) But now I live in Germany... and here it is not so easy to find Korean Restaurant! And suddenly you appeared...Thankssssssss!! Could I share one of your links in my Blog?? I just fell in love with your BLOG. I have been WONDERING how they do this for MONTHS! Born and raised in Korea but now living in LA, we share a love of Korean food.